In the early 1970�s the small town of Fouke Arkansas, and surrounding areas including Miller County, played host to what witnesses described as a large hominid like creature covered in long dark hair. The creature was estimated by most eyewitnesses to be roughly 7 feet tall with a weight of 250 to 300 pounds. Some reports even added that the creature�s chest was 3 feet in width. Later reports, published in the 1980�s suggested that the creature was must larger, roughly 10 feet tall with an estimated weight of 800 pounds. Some accounts of the Fouke Monster suggest that the creature may have run on its haunches in a slouched posture, swinging its arms in a similar fashion to a monkey. The Fouke Monster was reported to have a terrible odor and have bright red eyes, the size of a silver dollar. The Fouke Monster was given its name by Texarkana Gazette and Texarkana Daily News journalist Jim Powell, who often reported on the creature between 1971 and 1974. Local legend has it that the creature can be traced back to sightings in 1946, in the region of Jonesville, which gave rise to the name, the Jonesville Monster. Despite these earlier claims of sightings the name Fouke Monster stuck, and is still widely used to this day to describe sightings of any large ape like creatures spotted in the area of Fouke Arkansas. The Fouke Monster made headlines in 1971 when it reportedly attacked the home of Bobby Ford and his wife Elizabeth the night of May 1st. According to Elizabeth Ford, the creature, which at first she thought was a bear, reached through the screen window while she was sleeping on her couch. The creature was subsequently chased away by her husband upon returning from a hunting trip with his brother Don. Shortly after midnight, on May 2nd, while Mr. Ford was standing on his porch the creature reportedly returned and grabbed Bobby�s shoulder, throwing him to the ground. Mr. Ford managed to crawl free and was later treated at St. Michael Hospital in Texarkana for scratches across his back and a mild case of shock. The Fords claimed that during the encounter they fired several shots at the creature, and believed that they hit the creature, however no trace of blood was ever found. A search of the surrounding area failed to locate the creature, but did manage to locate several large three toed footprints close to the house, scratch marks on the porch, and some damage to a window and the house�s siding. During the following months sightings continued to be reported by local residents and tourists, including a sighting by Mr. D Woods, his wife Wilma Woods and Mrs. R. Sedgass who reported seeing an ape like creature crossing Highway 71. Several footprints where also discovered during this time, the best known where discovered in a soybean field owned by local gas station operator Willie E. Smith. These prints were scrutinized by game warden Carl Galyon who was unable to confirm or disprove their authenticity. Like the footprints found at the Ford residence, these prints seemed to indicate that the Fouke Monster had only three toes. About a month after the incident at the Ford residence, Southern State College archaeologist Dr. Frank Schambagh determined that the tracks were almost certainly a hoax. Stating that the tracks could not be from a species of ape, or ape man, as many of the eyewitnesses claimed, due to the three toed nature of the tracks. All primates and hominids, both modern and historical have had 5 toes; in addition Dr. Schambagh cited several other anomalies as part of his conclusion. He noted that the region had no history of primates, ruling out the possibility of the creature being the remnants of an indigenous species, also all primates known to man are diurnal, or being active in the day time, the Fouke Monster appeared to be nocturnal. 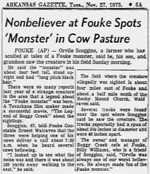 Sightings of the Fouke Monster during the early 1970�s attracted interest from both tourists and hunters. A $1,090.00 bounty on the creature was offered up by Little Rock radio station KAAY, several attempts were made to track the creature, including teams using scent dogs, but they where unable to locate the creature. The Fouke Monster became so popular that in 1973, the story of Bobby Ford�s encounter was turned into a semi factual, documentary style horror filmed named, The Legend of Boggy Creek. The movie played in drive in theaters around the country and grossed over 22 Million dollars, making it the 7th highest grossing movie of that year. The movie was shot mostly on location in Fouke and nearby Texarkana, though some scenes were filmed in Shreveport, Louisiana. The Legend of Boggy Creek did so well that it spawned two additional movies about the Fouke Monster. Return to Boggy Creek was filmed and released in 1977; the movie had an entirely fictional plot and was not intended to be a sequel to the Legend of Boggy Creek. It started Dawn Wells as the mother of three children who became lost in the swamp. The other movie was filmed and released in 1985 entitled, The Barbaric Beast of Boggy Creek, Part II. This film was written as a sequel to the first movie, The Legend of Boggy Creek and stared Brian Lockart, a University of Arkansas professor who leads a group of students into the swamps around Fouke. Sightings of the Fouke Monster have been sporadic since the early 1970�s, In 1991 the creature was reportedly seen jumping from a bridge, also in 1997 and 1998 there was a combined 40 reported sightings of the creature. A majority of Fouke Monster researchers believe that the creature may actually be the misidentification of a known cryptid, most likely Bigfoot. The biggest argument against the Bigfoot theory is that the Fouke Monster reportedly only has three toes where as all known Bigfoot tracks have 5 toes. One theory put forward to explain the issue of toes states that the Fouke Monster is in fact a Bigfoot, however due to the encroachment of man kind the creature�s migratory routes have been cut off. This geographical isolation would lead the remaining Bigfoot in the area to inbreed as means to keep the population going. 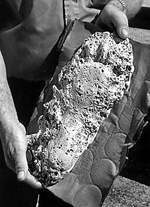 Science has proven that one of the first things to happen in an inbreeding population is the deformation and mutilation of fingers and toes, hence through the years the Bigfoot population known as the Fouke Monster could, according to the theory, lose two of its toes causing the three toed prints. Other researchers have noted similarities between sightings of the Fouke Monster and the Honey Island Swamp Monster reported to live in the swamps of Louisiana. Arkansas shares its southern border with Louisiana, and Fouke is located very close to the south west border of the two states. Tracks of the Honey Island Swamp Monster generally display the same three toed configuration seen in the Fouke Monster tracks. A large number of researchers believe that Bigfoot is a migratory animal, so it is not to hard to imagine that a population of Bigfoot, cut of from the larger migratory population, would still migrate with in a smaller area, and with the geographical distance between Arkansas and Louisiana being so small, its not hard theorize that these two creatures could be one in the same. With the exception of inconclusive footprints there is no physical evidence to support the existence of the Fouke Monster. Visit the Unknown Explorers page on Bigfoot to learn more about the evidence regarding the creature which could be the identity of the Fouke Monster. On May 1st 1971 The Fouke Monster reportedly reached into the home of Bobby and Elizabeth Ford through an open window while Elizabeth was sleeping on her couch. The creature was scared away in the process of breaking into the home by Bobby as he returned home from camping with his brother Don. On May 2nd 1971 The Fouke Monster apparently returned to the Ford residence and attacked Mr. Ford as he stood on his porch, landing him in the hospital for scratches on his back and mild shock.